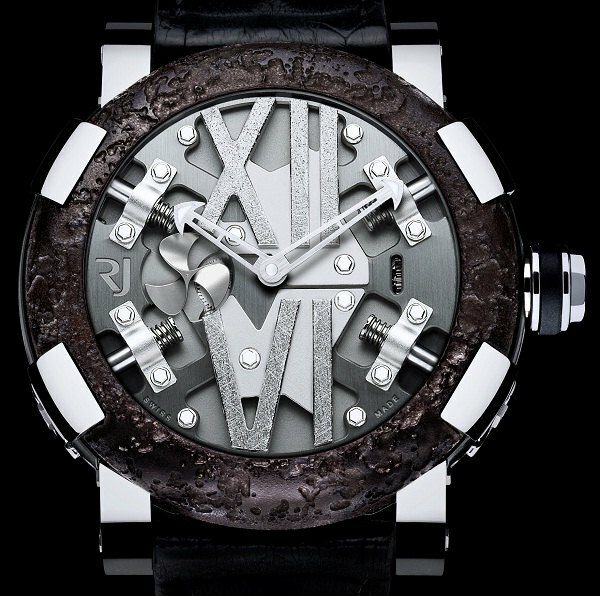 Romain Jerome (RJ) isn’t beating around the bush with this one. They call it what it is. 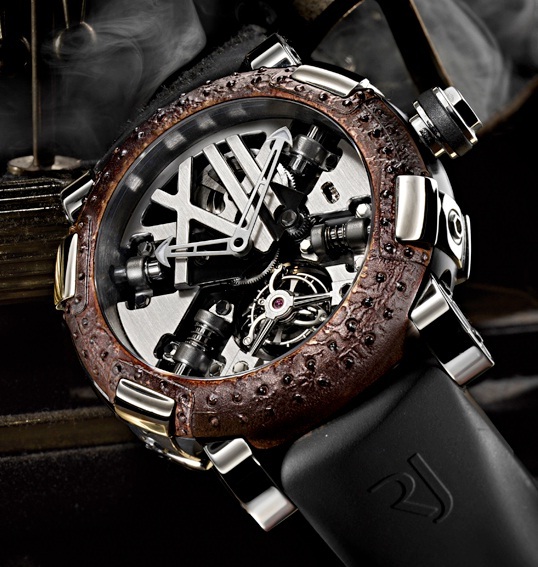 This is the new RJ Steampunk – and is a follow-up timepieces to the limited edition Romain Jerome Titanic-DNA Tourbillon Steampunk (hold on, let me take a breath) A la Grande watch from a few years ago. There are some differences in style, but the main change (aside from the dial design) is the lack of “Titanic DNA” part of the name and this time RJ uses a movement without a tourbillon -which will certainly help with affordability. The Steampunk is large at 50mm wide and the bezel is oxidized metal (going with the Titanic DNA theme). 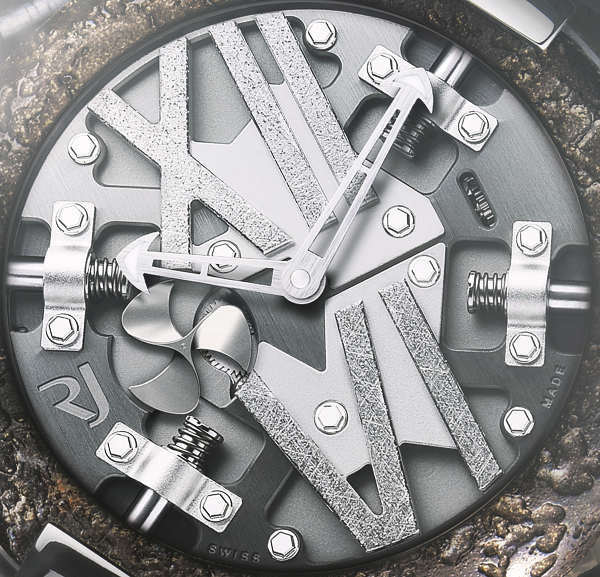 The “X” motif of the bezel claws are continued with screws that go deep into the dial. These screws are also meant to resemble steam engine pistons. The large Roman numeral hour markers for 12 and 6 are large and purposes done in a scratched-up texture. We have seen these hands before – and they are meant to evoke the Titanic’s anchor. It is pretty neat and still feels wild. 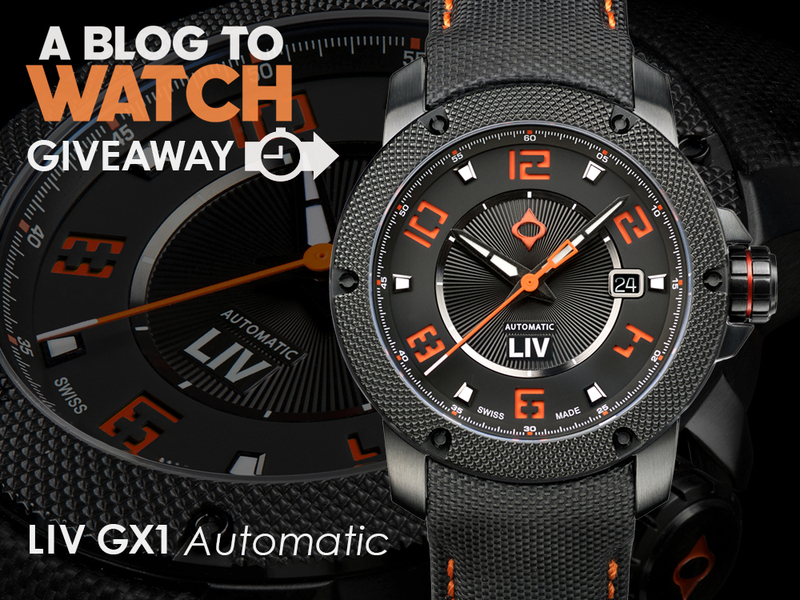 A watch like this is easy to poke comments at, but think about it… you’d probably gladly wear it. I’ve always liked the contrast of this bezel and the polished case and claws. That is done well. Romain Jerome’s current CEO Manuel Emch has been taking what he likes from the brand’s personality vault and polishing it up. Right now I enjoy that Romain Jerome is focusing on mechanically more simple watches and stressing their design ‘DNA.’ In a sense it is a test to see which models prevail in popularity a few years from now. Those models will likely get more complex treatments then. The watch industry of 2010-2012 isn’t likely to be too much about experimentation. Inside the watch is a Swiss automatic movement with a subsidiary seconds dial. I have seen propeller subsidiary seconds dial hands before – but this one done like a ship propeller is really cool. Strap is rubber, and I understand that there might be some gold versions, as well as those with PVD black steel (versus the polished model as seen here). As a fan of all things steampunk (aside from the outfits), I look forward to trying this piece on. 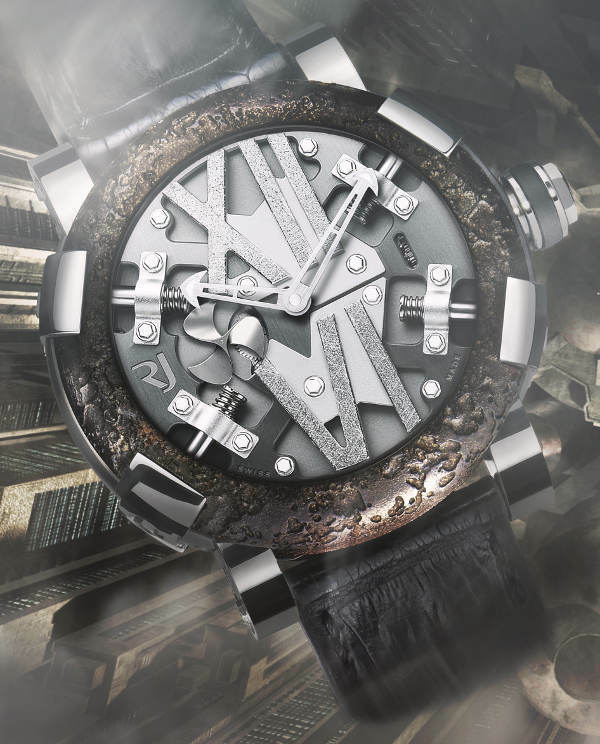 The Romain Jerome Steampunk watch will be limited to just 2,012 pieces with a price of 12,500 Swiss Francs. Rhodiumed & polished small seconds at 9 o’clock, propeller shape. Is that ETA in there? No, I think they use something else. Forgot the movement maker. 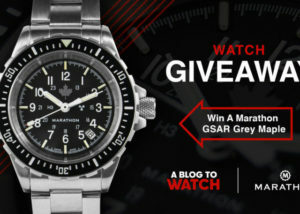 Interesting watch. Ilike the insides but the case…I dunno. I’m all for contrast but the case suffers from areal bad case of acne. It reminds me of my high school prom date. Which factory produces the Romain Jerome watches? Although it was the former CEOs idea to be known as the Titanic watch brand,Im glad the current RJ CEO Manuel Emch decided to continue their Titanic DNA saga! The Titanic will never be forgotten and neither will anyone who becomes associated with it. In the luxury watch industry this indeed is history in the making. For the conventional watch collectors who are searching for something unique, these are the watches…..Romain Jerome,Titanic-DNA,Moon Dust DNA! This watch looks very cool. If they decide the product a non-steampunk version that is a bit smaller, the watch will have killer looks though.